Though it wasn't explicitly stated I picked up on the importance of multi-device experiences at Google's recent I/O conference. Across multiple sessions and keynotes products that spanned across more than one device were announced and demoed. Here's a few that caught my attention. Google's newest Chrome browsers now sync your Web history across multiple devices. That is if you browse through several Web pages on your laptop computer using Chrome, then open Chrome on your mobile device (iOS or Android) your session is preserved. The back button works just as if you were on your laptop computer. This is an example of keeping not only your files but activities in sync as you shift between devices. The design consultancy precious did a great job categorizing multiscreen patterns a year ago. But recent examples like Chrome browsing sync seem to combine several of these patterns (in this case synchronization and device shifting) into one. Perhaps it's time to revisit the list? Google Drive is a cloud-based file management and collaboration tool that can be used on Mac, Windows, Web browsers, iOS, ChromeOS, and Android devices. When collaborating on a file, you can not only see changes from others in real-time but you can see those changes instantly on all your devices. As demonstrated in the video below. This is another example of combing synchronization and device shifting as content and files are not only kept in sync across device but you can pick up right where you left off in a workflow when you switch devices (similar to the Chrome browsing sync feature). 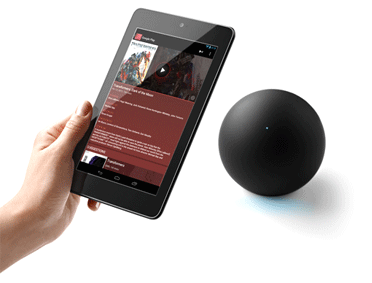 Google's streaming media player, the Nexus Q, has a very few of its own controls. The primary way to interact with it is by using an Android application on a smartphone or tablet. In this case, one device is being used to control the other. This "remote control" pattern is increasingly common as many new devices are capable of connecting to the network but do not have their own display and controls. Another of Google's hardware demos at I/O, Google Glass is rumored to have some element of remote phone/tablet control as well. During the Sensitive Side of Android session, the presenters demonstrated a game of Blackjack using four Nexus 7 devices simultaneously. The four different players were each able to use their own device to play the game with each other. This is a pretty explicit example of the simultaneity pattern in action. In the NFC and Android Beam session, Google showcased their near field communication (NFC) sharing technology: Android Beam, which allows content to be shared between multiple devices and more. Content sharing across devices could be thought of as either a screen sharing or device shifting pattern.